The Out to Lunch arts festival in Belfast has reached its half way point. The first couple of weeks have been dominated by words; now it shifts to music for the final two weeks. 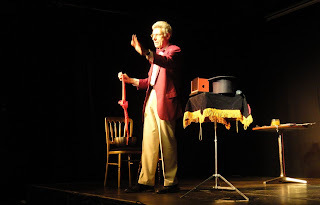 I've only got along to one event so far - Friday lunchtime's show with Marxist Magician Ian Saville who entertained a packed Black Box with his brand of political insight and illusion. Comics sometimes take a long time to warm up a Belfast lunchtime audience, but Ian Saville had the crowd giggling and tittering right from the start of his easy going act. Half magician, half comedian, total Marxist! 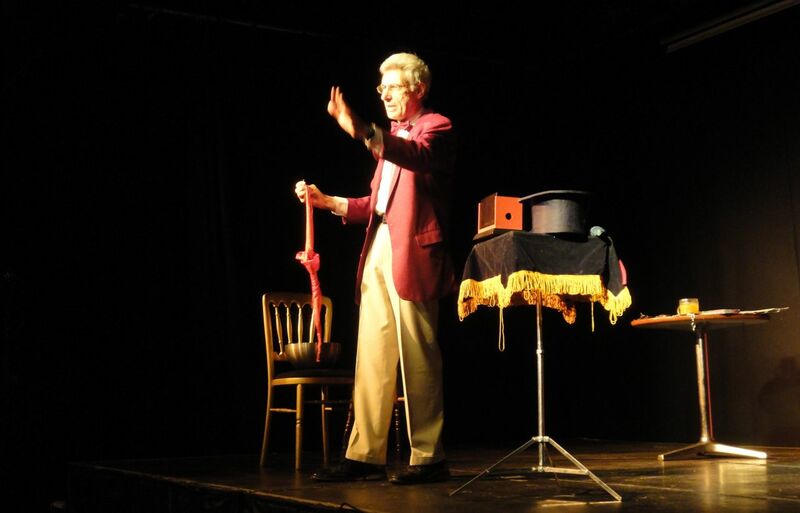 Tricks with handkerchiefs, ropes, ventriloquism, making a £20 note disappear and reappear, and a bit of escapology to finish. But tricks all with a message. The tearing up a newspaper trick and unfolding the pieces back together while dropping one to leave a complete paper with a square missing was done to perfection - one day the socialist factions that normally tear themselves apart will reunite, though there's always one awkward lot who won't co-opearate! Great fun, and with a socialist message too. Possibly the funniest moment was when he asked a member of the audience to examine his manacles and she quipped that they were just like the last pair she'd seen! I caught up with Ian Saville afterwards to find out more about how he'd become a Marxist magician (MP3 audio). Don't forget to check out the rest of the programme. Sunday afternoon's gig with Elizabeth Cook still has tickets and there are lots of other promising gigs to follow. Thanks for the great report, as always, Alan. Just a word that Elizabeth Cook is very entertaining. She is funny, bawdy and completely entertaining. I think she is probably touring with her husband, Tim Carroll. He was a real favorite of mine when I lived in Nashville. Saw them in Atlanta last year and was very charmed. And like every good marxist, can he pull 40 or 50 million corpses out of his hat like Chairman Mao or that butcher Stalin? How many dead can we attribute to the Marxist reign of terror upon mankind, 150-200 million murdered by its madness? Yeah, marxism sure is real magic. Phooey.